Trump: 'Nothing to apologise for' Jump to media player Republican presidential candidate Donald Trump defends a comment he made about a Fox News presenter during a TV debate. Donald Trump: I don't wear a toupee Jump to media player Republican presidential hopeful Donald Trump hits back at accusations he wears a toupee at a rally in Greenville, South Carolina. Fury grows over Trump McCain slur Jump to media player John McCain has urged Donald Trump to apologise to US military veterans after he appeared to question the "war hero" status of captured soldiers. Trump loses bid for wind farm review Jump to media player Donald Trump's second challenge into an offshore wind farm near his Menie golf course is rejected at the Court of Session. Journalist kicked out of Trump event Jump to media player A news anchor was thrown out of a Donald Trump news conference after asking a question about immigration, without being called on first. Donald Trump to run for US presidency Jump to media player The businessman Donald Trump announces his plan to run for the US Presidency in the 2016 election. US election: Can Trump 'trump' his US rivals? Donald Trump is taking on 10 other fellow Republicans with presidential ambitions at a debate in California. The billionaire is still the front-runner for the Republican nomination, and in recent months he has increased his lead over the other candidates. 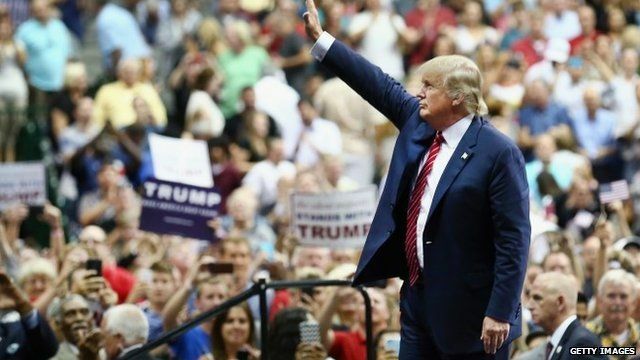 The BBC's Jon Sopel looks at the success of the Donald Trump campaign so far.